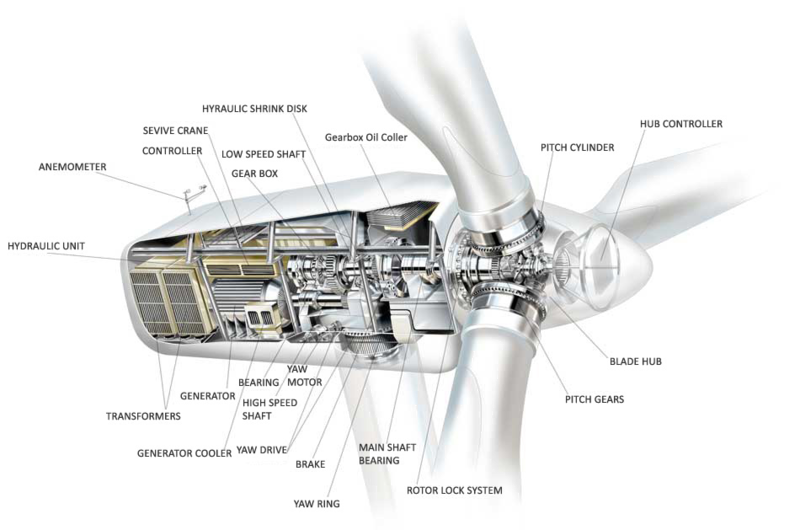 Home » Wind Turbines » How does a Wind Turbine Work? Wind turbines work on a very simple principle: the wind turns the blades, which causes the axis to rotate, which is attached to a generator, which produces DC electricity, which is then converted to AC via an inverter that can then be passed on to power your home. The stronger the wind, the more electricity is generated from the motion. That’s why we tend to see industrial scale wind farms with high towers and large blades located in the breeziest parts of the countryside, including offshore. A turbine’s efficiency comes from how well it captures the power of the wind and turns it into a rotational torque that can then push electrons out from the generator and into the grid. The towers are normally made of steel but the blades can be manufactured from glass fibre or reinforced polyester that need to be strong yet light enough to turn in the wind. A single 1.8 MW wind turbine running at normal capacity will produce enough electricity in a year to feed 1,000 average homes. The Whitelee Wind Farm in Scotland has 140 turbines that provide electricity for around 180,000 homes. The core component of a wind turbine is the generator which converts mechanical energy into electricity. We’ve known since the early 19th century that if you turn a conductor in a magnetic field then it creates electricity, according to Faraday’s Law. So the wind provides the movement and torque and the generator does the rest. For an industrial scale turbine, like the ones you see on wind farms, there will normally be an anemometer that is attached to a control panel. The turbine is activated at wind speeds of over 8 miles per hour but the machine is shut off with speeds in excess of 55 mph to prevent damage. The gear box is used to change the slow motion we see from the blades turning to the faster motion of the axis which actually drives the generator. This is one of the most costly parts of the wind turbine, changing speeds of 30 to 60 revolutions per minute into a thousand rpm. It’s one of the areas that researchers and developers are looking to make more efficient so that a greater current of electricity can be produced at slower speeds. To cope with varying wind directions, a yaw drive is often used to move the blade array into the oncoming wind. The generator produces an AC current that is fed into the grid and used to power the surrounding homes. 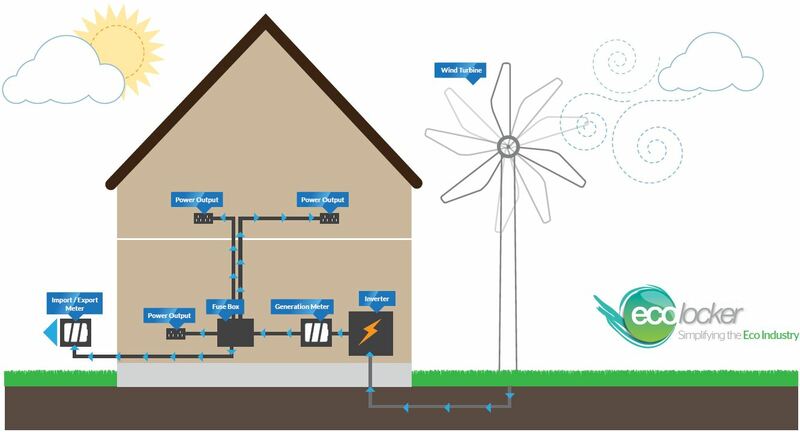 As with solar panels, domestic wind turbines need the right components to supply your house with electricity. The generator will produce a DC current that has to be converted into AC by an inverter and there are batteries that can be used to store energy for later use. 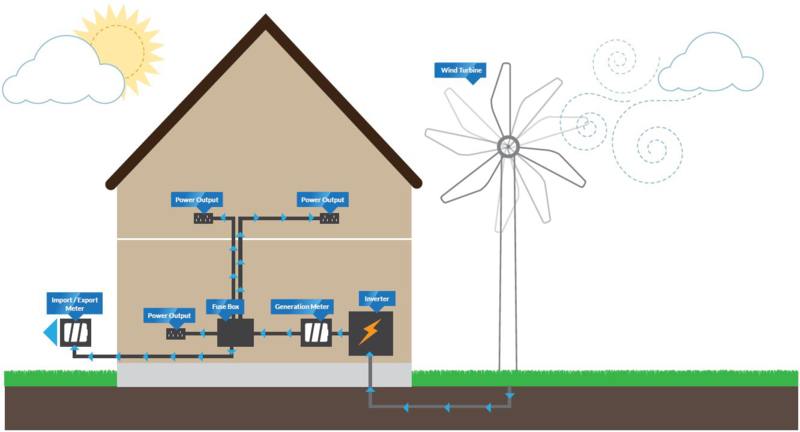 Find out more about the electronics of domestic wind turbines. How Much Electricity Do Wind Turbines Create? To power a domestic home you need a substantially sized wind turbine. Even average sized wind farms they are large and very noticeable with perhaps as many as 40 or 50 huge turbines working hard to produce electricity. The newest and largest wind farm in the world has just received government approval in the UK. Situated 45 miles off the coast of Kent, the East Anglia One offshore wind farm will have 240 turbines producing some 1,200 MW of electricity. Gwynt y Môr off the coast of North Wales is currently the largest offshore wind farm in the UK. Still under construction, half its 160 turbines are now operational and it is expected that the completed farm will provide enough electricity for about 400,000 homes. If you want a wind turbine installed for domestic use then you really need to have a remote location where other buildings and infrastructure won’t get in the way. There are two different types of domestic wind turbine (LINK): Roof mounted and free-standing. The idea of putting a wind turbine on your roof seems like a good idea but the problem is that these don’t produce enough power to make you truly independent of the grid and produce all your own power. You get more output from a free-standing wind turbine that operates similarly to the ones you see in wind farms. The downside of free-standing turbines is that they cost more – a building mounted turbine would set you back around £2,000 whilst a free-standing could cost anything from £20,000. The truth is that wind power is currently more viable for those in a remote location (that is outside of urban and suburban areas) that has a good, strong and steady wind source. The size of the array needed to produce enough electricity for domestic use is often too prohibitive for anyone else. However, much research and development is being undertaken to make wind power more effective and there may be turbines in the future that can be used in our cities and towns in much the same way as solar power is today. For a look at the future of wind turbine technology take a look at our blog for an update.